The closeup on the right shows the fluffy nature of the fungus. With a more advanced case the roots would have rotted away completely. This is a serious fungal disease caused by Sclerotium cepivorum, which affects all members of the Allium or Onion family. The fungus grows on the roots of the plant, causing them to rot. The leaves show yellowing and wilting due to the lack of roots. The bulbs remain in a stunted form with most roots and the basal plate rotted away. 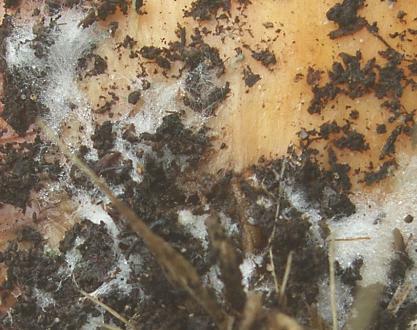 A white fluffy mould covers any of the outer skin which is underground. 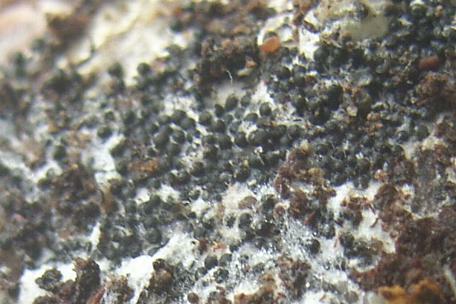 It persists as small, black, dormant structures called sclerotia, which can remain in the soil for up to 15 years and are very easily transferred to other sites, even on the soles of shoes. Infested areas should not be used again for growing onions or garlic for about 15 years. Infected plants should be removed and destroyed by burning or sealed in bags for dumping - never place on the compost heap. 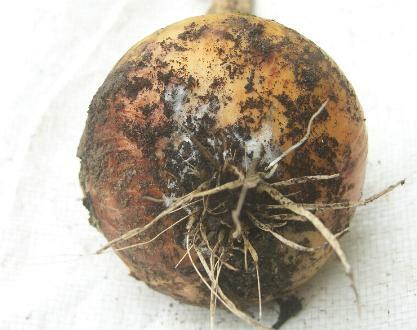 A portion of the surrounding soil could be removed with the infected bulb to hopefully prevent further infection. Any remaining bulbs should be well spaced to reduce the chance of them being affected. It can be brought in on onion sets and garlic cloves so some growers raise their crops from seed instead. Even shop-bought onions may carry the sclerotia so peelings should not be composted. There is no chemical control for gardeners. Fortunately the fungus is very specific in what it grows on so other types of crops can be grown in the area, but if space allows it would reduce the possibility of carryover to put the area down to permanent planting instead, eg. fruit bushes, rhubarb or asparagus. Any tools used for cultivation should be disinfected, or perhaps separate ones kept for working the affected soil. Growing allium crops in containers with brought in compost will enable some to be produced. A couple of garlic cloves raised under cover in the winter, then moved outdoors in the spring will produce better crops than if they were grown in the open and avoid the rot. Leeks for show are usually grown in pots, so can also be raised this way. Commercial growers sterilize affected areas using methyl bromide fumigation, but eradication is not complete. Some work has been done using a petroleum based stimulant, diallyl disulphide, which has a similar sulphurous odour to alliums that causes the dormant sclerotia of the fungus to grow and since there are no roots present as a food source, it dies away. Other trials have used garlic powder which is cultivated into the ground and results are said to be similar to the petroleum-based compound in exhausting the numbers of sclerotia in the treated area. Composted onion waste and Eucalyptus leaf mulch have been used in laboratory conditions and they reduced the viability of sclerotia. When used in the field these types of treatments produce a increase in the yield of an onion crop. Garlic powder would probably be the easiest treatment for the gardener to use, but it is difficult to get it down into the soil evenly. It could be used in a four year crop rotation, applying it each year while the non-Allium crops are growing, so when it is time to grow onions again the dormant sclerotia should be greatly reduced. There is a home remedy which appears to work made from lime and soot. The soot is allowed to weather for about six months to leach out dangerous chemicals. A tablespoonful of each is applied per onion set or garlic clove at planting time. The combination of the two probably releases a similar sulphurous ordour to fool the sclerotia.